We are only in New York for 48 hours, and we really do only have time to scratch the surface, but we have made a list of places we want to see. I dithered about buying a NYC pass for all the entrances but I really didn’t know how much time we would have so in the end I didn’t buy one. We are all up pretty early, so we head out for breakfast just before 7. I’ve had this place chosen for months, Ess-a-bagel. It’s just around the corner from the hotel, looks fab and we all love bagels. We get there very quickly and it looks very busy with them packing up orders for delivery, and people getting takeaway but all the tables are being used for packing the delivery orders and it doesn’t look very inviting to sit down and eat in. We have a little debate and decide to head back to a place near our hotel that had looked nice. 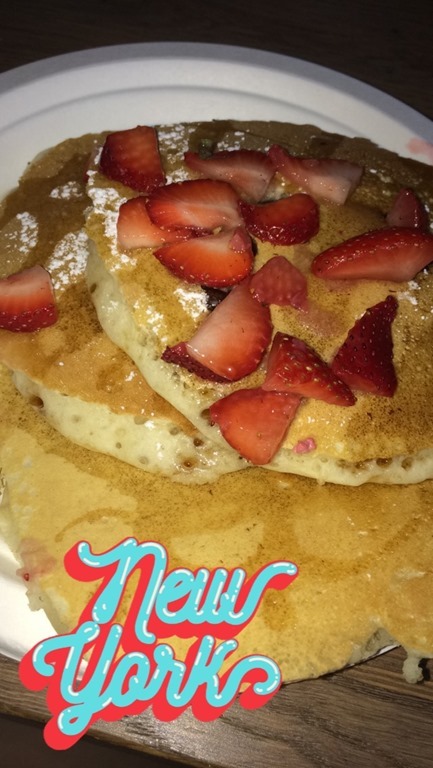 It was called ‘Fresh’ and they offered lots of healthy things but most interestingly pancakes. So we all had pancakes and coffee / juice. It was very good, and we enjoyed our breakfast. We had a look at the loose plan I’d made, and decided to start with the Empire State Building. 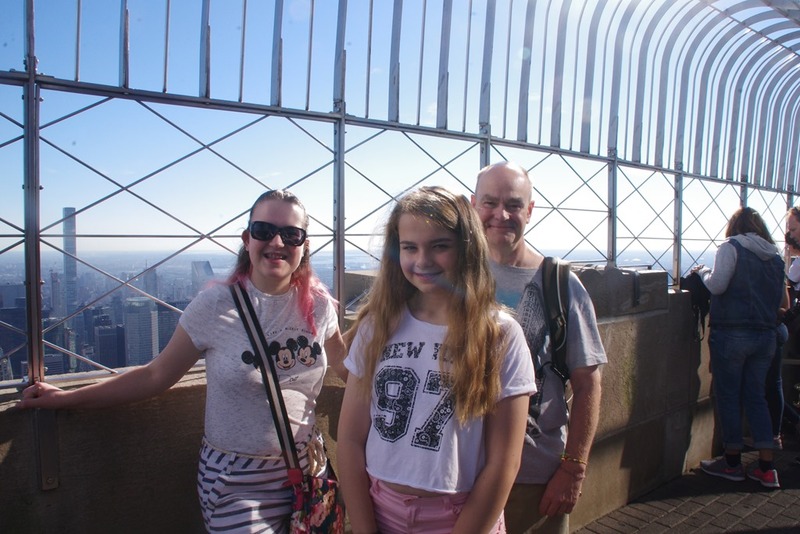 I had pencilled in Top of the Rock, as I’d read it was better to go up there and look at the Empire State, but really we all wanted to go up the iconic building, even if it meant we couldn’t see it. We walked, which was quite pleasant as it wasn’t too busy. It wasnt’ too warm either and I was worried we were going to be cold as we’d only really packed shorts and thin tops for Florida. 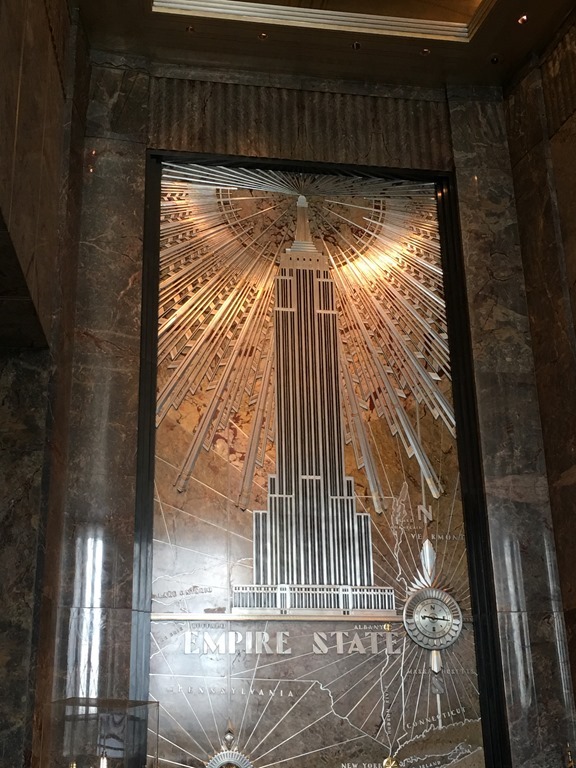 We reached the Empire State Building shortly after 8, and went straight in. There was no queue, but you could see that they catered for huge queues later in the day so I was pleased we were there early. We bought our tickets and went straight to the lifts. Molly was pretty nervous, which surprised me as she’s normally not bothered by heights etc. 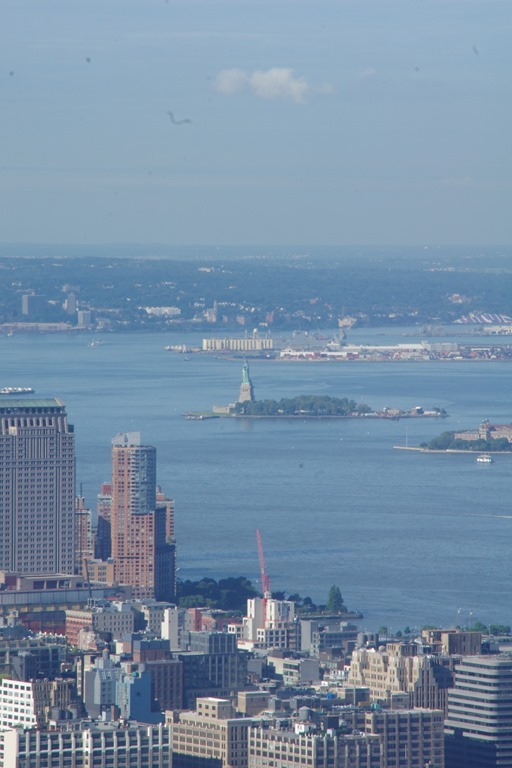 But when we got out on the 80th floor and we were inside, she was ok. We had a good look around the 80th floor, taking some photos out of the windows, and then headed upto the 86th floor where the famous observation deck is. I wasn’t sure if Molly would come outside but once we were up there she decided she wanted too. We had a wander around, taking some photos and the all important snapchats with the Empire State filter on it, and then we went back down to the 80th floor gift shop. They have this all arranged so you go through the gift shop and then down the lift, but we wanted another look around on this floor, so we asked someone and were directed through a closed off area and back to the lifts where we could essentially start again. We had another look around and read all the information this time. It was interesting, and then we took the lifts back down. While we were up the tower, we spotted Macy’s and realised that it wasn’t far away at all, so we decided to make that our next stop. It was just around the corner, but when I tried to open the door it was locked. I was a bit confused, but eventually realised it was only 9:40 and Macy’s didn’t open until 10. We thought we’d get a drink while we waited, but Molly spotted Sephora, so we went in there instead. This is not my favourite place, but she loved it. She saw loads of brands I’d never heard of but she knew all about. She dithered and debated about buying something, but decided to wait. At 10:00 on the dot, the doors opened, and we went into Macy’s with quite a little crowd that had been waiting outside. 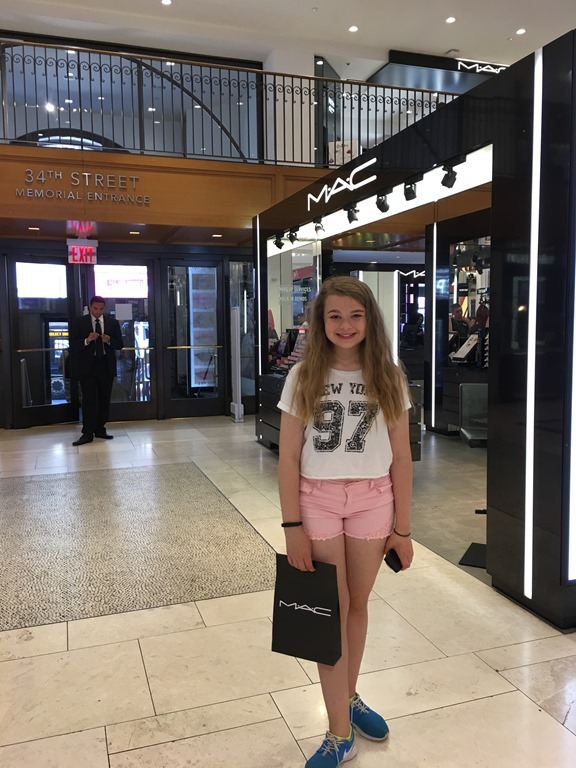 As luck would have it, we were in the makeup department….. Molly was thrilled,especially when she spotted a MAC counter. They had a section called ‘Little Mac’ where they were selling miniature products for $10, so she decided on a lipstick. She was especially pleased with her purchase. It was only about 10:30 but we’d been on the go for ages, so we went to the Starbucks in Macys’ for a rest and a drink. The drinks were good but disappointingly there were no comfy chairs in this Starbucks. 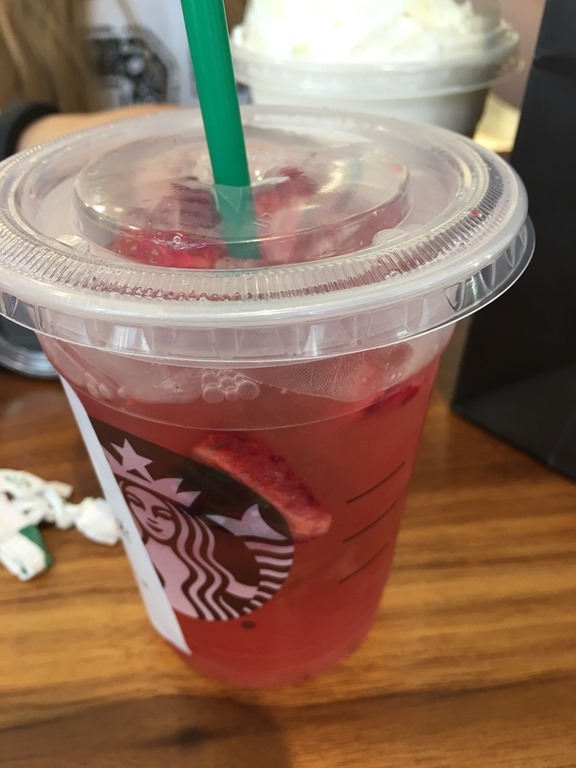 I had a ‘Strawberry Acia’ with lemonade. It was very good, and I will be having another before I go home. It was nice to just sit for a minute, and look at the Subway map and take stock. 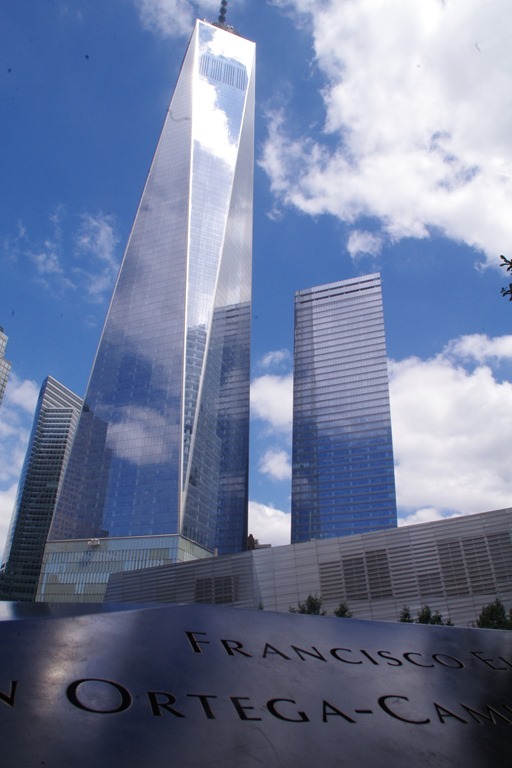 I decided to ask at the information desk about the best way to get to the World Trade Centre, and we were directed to a slightly further Subway station which put us on a direct line. This was really useful, as I’d have gone with the nearest station and then changing, so having a bit of advice got us on an easier route. 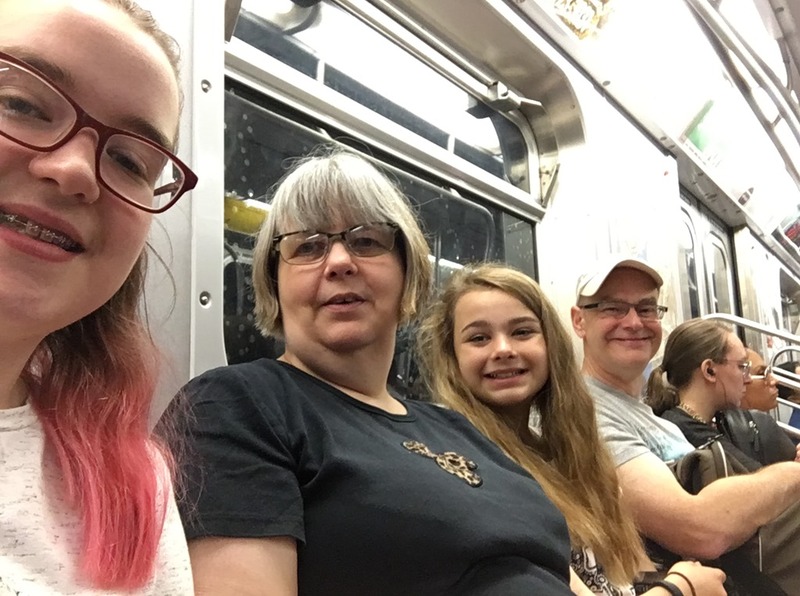 We walked over to the station on 8th Avenue, and down into the Subway. We managed to buy Metro Cards, we got 2 as you can share them, and we loaded them up with $11 each, which would get us 2 trips for 2 people (it’s $2.75 per trip). Once we’d managed to operate the ticket kiosk the rest was very straightforward. The train was pretty empty and World Trade Centre was the last stop, so we didn’t have to worry about missing it. When we got off the train and emerged from the station, we were just surrounded by people trying to sell bus tours and tickets for the One Tower. The bus tour people were everywhere, all day, but at this particular point they seemed really pushy. We didn’t know exactly where we were going, as there is a lot of construction going on and hoardings everywhere and so it was hard to get your bearings. 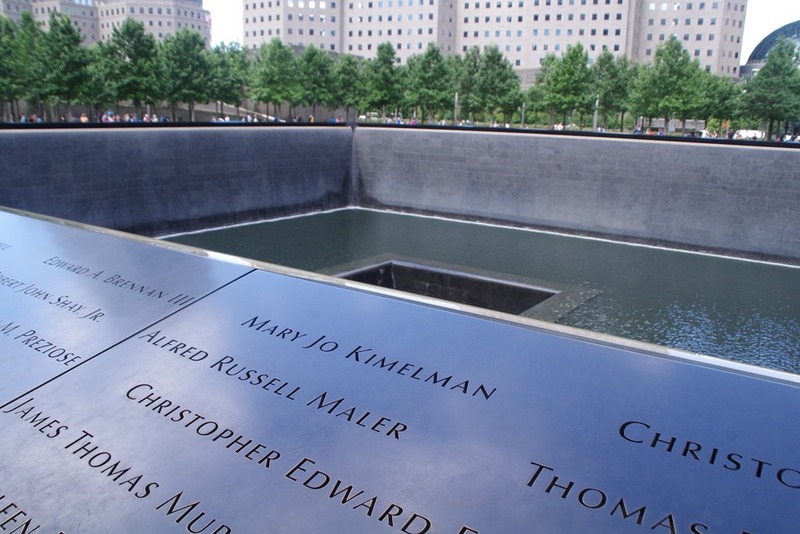 We ended up walking right around the block with the church, and back to the Subway station but then we saw where we needed to go and found our way to the memorial. There is a museum here as well, but we’d decided just to visit the memorial. It’s quite a surreal thing. You are surrounded by sky scrapers, and then there is just this space. And it’s hard to comprehend what was there, and what happened. Except for the names. So many names. We tried to be respectful and just take a moment to think and remember that behind all those names are real people. I wonder what it must be like to work in this new building, looking at the reminder every day. 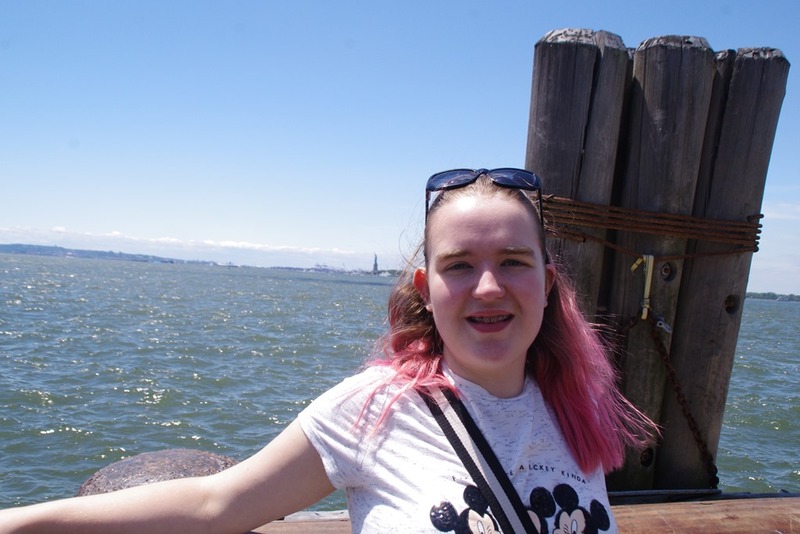 Our next stop is Wall Street and then Battery Park, we follow crowds of people, it’s getting very busy down here, and walk along Wall Street and past the New York Stock Exchange. 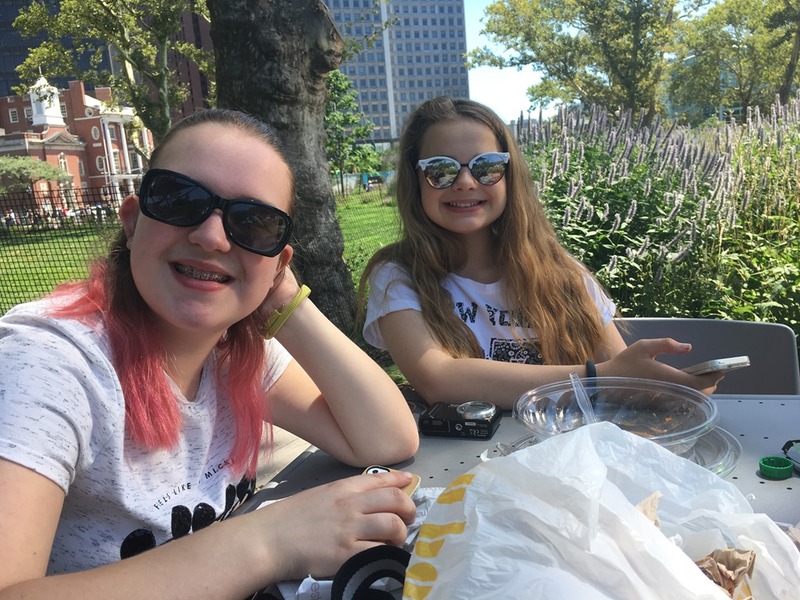 I had wanted to find the Bull Statue, but we are a little lost and everyone is getting hungry so we find somewhere to get a sandwich and then take them to Battery Park. This was lovely, we found a picnic bench next to a sort of Carousel, it was in a glass building filled with Sea animals, and they played quite peaceful music as it went around. I was quite taken with it. It was nice to escape the hustle and bustle and it felt very peaceful and quiet. It was also fantastic to sit down for half an hour but I wasn’t entirely sure I was going to be able to stand up and continue walking. 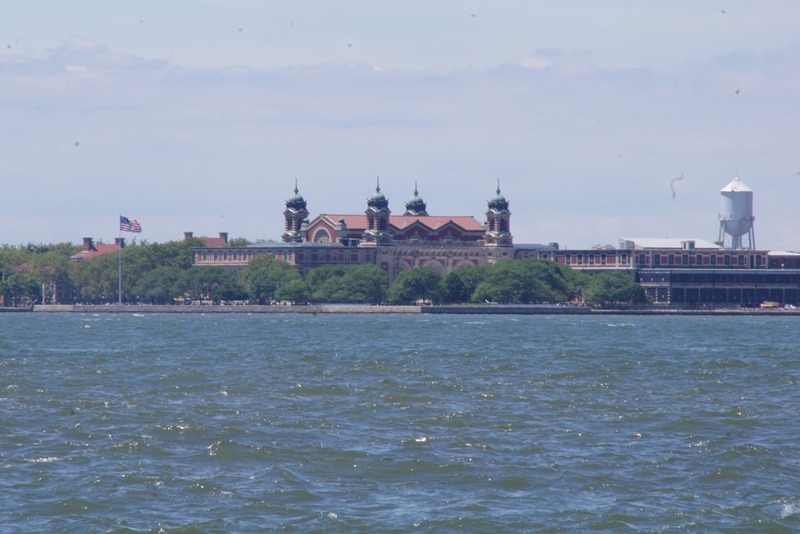 The plan had been to take the Staten Island Ferry to see the Statue of Liberty but we can see it from the park, so we decide to walk down to the waters edge and have a look and decide if we need to take the Ferry or if we are happy with our view from the park. We decide that we are quite happy with our view, and we don’t need to see it up close. Our next plan is to find the right Subway to take us back to our hotel. Our hotel is on the 4/5/6 line, and we see a station but it’s closed, there is another entrance across the street, this takes us past the queue for the hop on hop off bus, and at mid day at Battery Park the queue is enormous, I think you’d have been waiting for 2 or 3 buses before you got on. I had considered booking a bus but I was pleased we hadn’t. On the platform, there is a train coming ‘express to Lexington’, our hotel is on Lexington and 51st, so we get onboard. It’s significantly more crowded now, and we don’t get a seat but it’s pretty quick as it skips loads of stops, including ours. We end up at Lexington and 59th. So we have to walk back down to our hotel. It’s not a disaster as it’s quite interesting just walking past all the different shops and seeing the city. We get back to our hotel and just chill for a few hours. We’ve walked a long way this morning and everyone needs a break. The kids head to the lobby for some wifi, Molly has very important SnapChats to send…. 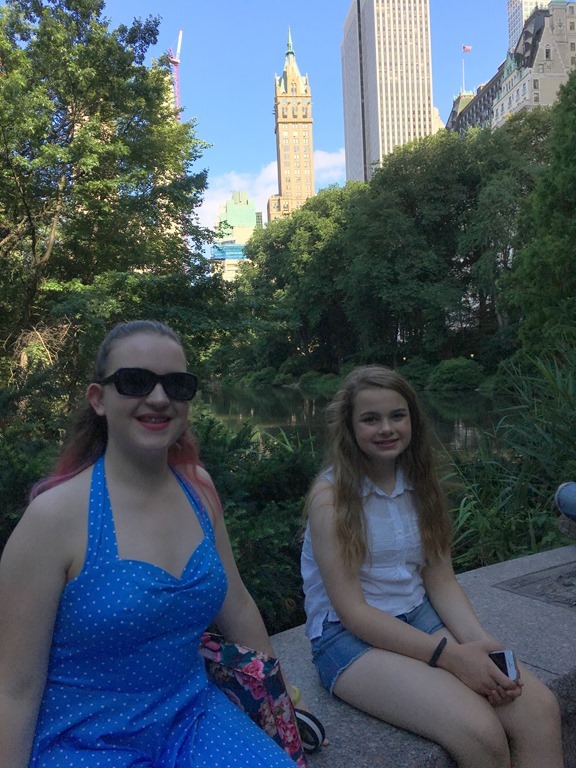 We have tickets for Aladdin and we need to collect them at 6pm, so we head out about 4 to walk to Central Park, via the LOVE statue, and then down to the theatre. This is not a particularly direct route but it takes in a few things on our list that we haven’t seen yet. Molly also wants to return to a shop and buy a sweatshirt she’d seen yesterday. 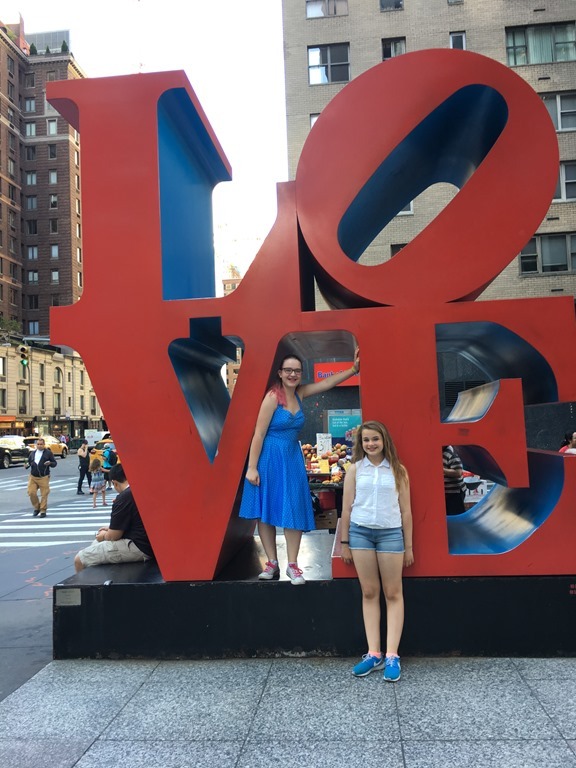 We walk across to 6th Avenue, and then up past the LOVE statue and into Central Park. We really only have about half an hour so we don’t go far, just in a short way where we see a little amusement park. We sit on a rock and just soak up the atmosphere for a while. We decide to walk back down 5th Avenue, to see some of the big shops and then along 51st back to the T-Shirt shop where Molly buys her I Love NY sweatshirt. We’d looked at this in a few places, but some of them weren’t as nice, so she had wanted to come back to this particular shop where she’d seen one she liked the look of. We then had to walk down 7th Avenue to 42nd street to find the theatre. This shouldn’t have been too hard but it meant crossing through Times Square, and it was just crazy busy. We could hardly walk for people, I found this the most frustrating thing. We walked a lot today, but so often we couldn’t actually move as the pavements were full of people standing, or trying to sell you a bus tour, and the crosswalks were often blocked with traffic when you got the ‘white man’ telling you it was safe to cross. We did eventually find the theatre, and easily exchanged our voucher for tickets in the Balcony. We had about half an hour before the theatre opened, so we popped into McDonalds for a drink and a snack. This was the hugest McDonalds I’ve ever seen, 3 stories, and they had a system where you paid at one till and collected at another – very much like Argos. I was desperately thirsty and it seemed to take an age for my drink to arrive but we did get it eventually and had a quick drink and some chicken nuggets – very classy pre theatre meal..
Once the theatre opened, we were in quite quickly, although there was a bag check on the way in. Katie wanted to buy some ‘merch’ and so we looked at the offerings. She settled on a t-shirt for the princely sum of $40. Molly considered it but decided it was all too expensive. Our seats were in the balcony. After the 25,000 steps I’d done today, the balcony was nearly a step too far. The final flight of stairs were extremely steep and I was seriously regretting not taking the lift. I did make it, and then we were directed back down an incredibly steep flight of stairs to our seats. It’s a long time since I’ve been in the gods, and I’d forgotten just how terrifying those stairs are. 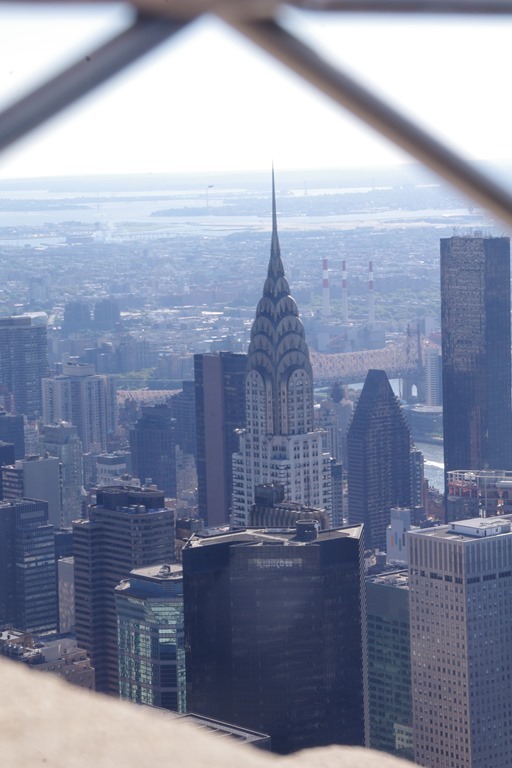 I don’t mind heights like the Empire State Building, but balconies are not my favourite thing, and I was very nervous. We were in row C, right in the middle so we had a great view, if a little vertical. The show was superb. It’s actually changed quite a lot from the film, which surprised me, there are some new songs which were all excellent, the genie was fabulous, and You’ve got a friend in me was just superb. I don’t know how they do it, but there were dancers being catapulted out of the stage floor at one point. 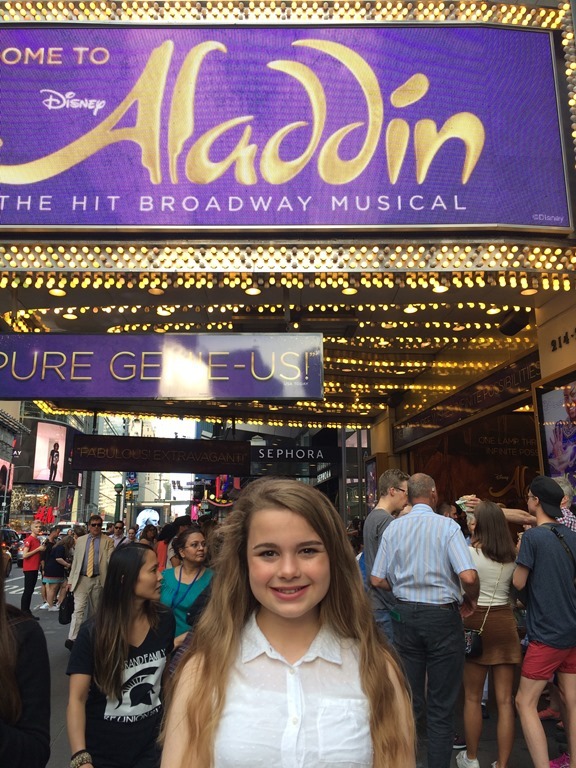 I will admit, Aladdin wasn’t my first choice of show, I’d really wanted to see the Lion King, and Katie would have loved Hamilton, but Aladdin was the one I could get tickets for, and it didn’t disappoint. We all really enjoyed it. It made for a very long day but as we really only had one day in the City, we didn’t want to miss the opportunity. When the show as over, we walked out of the theatre, and back along 42nd street past all the lights on Times Square. 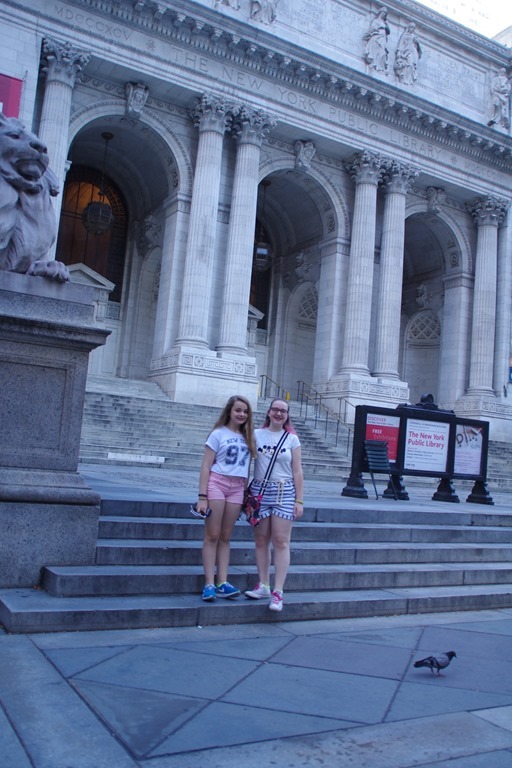 We had considered walking back to our hotel but when we got to Grand Central we decided to get the Subway. It was just one stop up to our hotel (we managed to get off at the correct stop this time). Just outside our hotel, we saw Fresh where we had had breakfast, so we decided to get something to take back up to our room. We were all very tired, but decided on soup or chilli, and all got a takeaway bowl and we took it upstairs to our hotel room where we tucked in. It was just what we needed. What an epic day – I logged 26000 steps and over 11 miles walked. No wonder we were all tired. So glad you didn’t get the hop on hop off bus. You waste so much time waiting for them then sitting in traffic. The subways are the easiest way to get around and once used a few times easy to navigate. 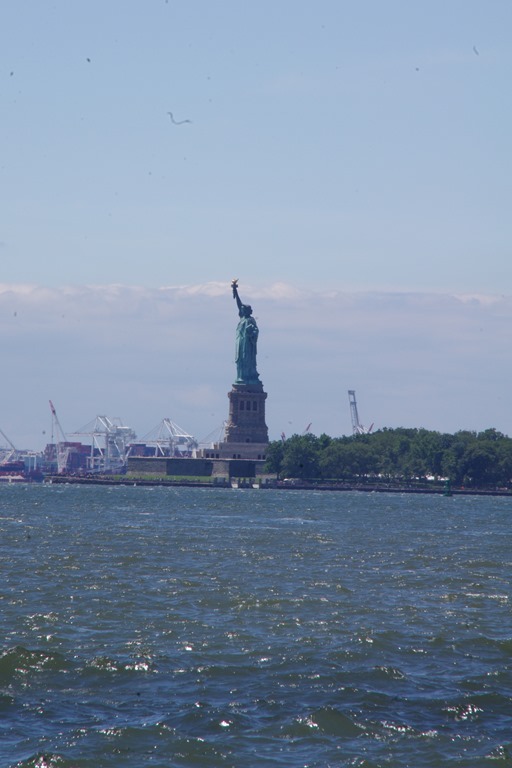 If ever you go again, take the East a River Ferry from Pier 11 in the Financial District by Battery Park, up to east 34th Street. You go under all the bridges and for €4 worth every penny. Have a good rest and safe travels for your next leg. What a great tip. We’ll have to come back! Wow, an amazing first day – you must be shattered after all that walking! 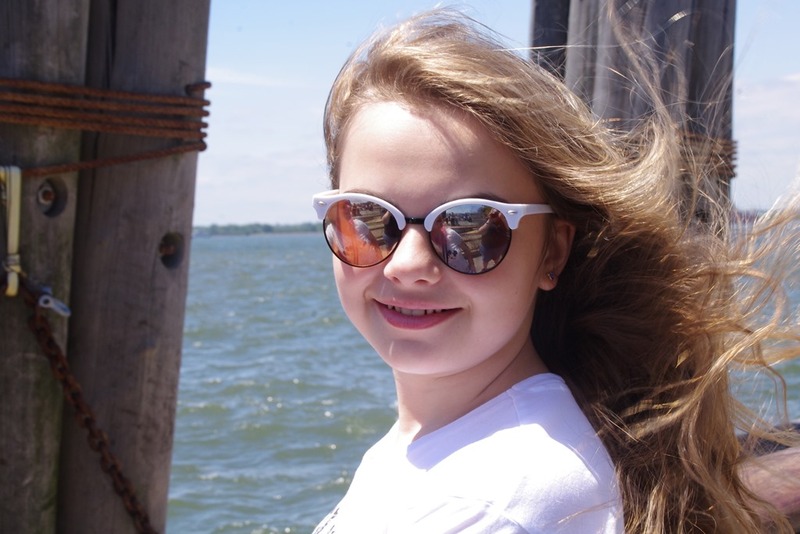 Hope you’re having a good rest & enjoy the rest of your wonderful trip. Loving the trippie by the way!